When it comes to modern-day commerce, mobile is fast-emerging as the new front line for where customers are won and lost. 95% of Americans now own a cell phone of some kind, according to the Pew Research Center – 77% specifically with a smartphone in their pocket. What’s even more critical, however, is the fact that 78% of respondents to the Mobile Ecosystem Forum made a purchase directly from their mobile device last year. In the face of such statistics, brands and retailers need to figure out a way to ensure that they’re winning as much mobile market-share as possible. It means engagement. It means strategy. It means apps. And if there’s one brand that’s proving that it knows how to excel on all of these fronts, it’s leading global lodging company Marriott International. As with practically every hotel and hospitality player on the planet today, Marriott has been focusing hard on building loyalty. And as the company’s latest updates to its mobile app began rolling out at the start of this year, we can see how Marriott’s strategy is forming. Much of it comes down to providing greater personalization through the use of mobile technology. Even before the grand overhaul of the Marriott Mobile App – released in February this year – the company was already winning the mobile game, with $1.7 billion in annual gross bookings coming directly from the application. Now, however, the new incarnation of the download has changed the experience from being a simple booking service to a personalized travel concierge, deploying a host of new features that drive engagement and build loyalty. No matter where users of the app are on the customer journey – be they planning a trip, already travelling, or bedded down in their hotel rooms – the app displays personalized features and content based on what services users are most likely to need in that specific moment. Driving the new mobile app experience is extensive research and member feedback. Much focus on delivering convenience has gone into the overhaul the Marriott application in an effort centering around giving users what they want. So, what can the app do? Well, for starters, the already-popular mobile check-in/checkout feature has been upgraded, now enabling users to use the app to request room upgrades and receive a notification as to whether or not the request has been fulfilled before they arrive at their hotel. Late checkout requests can also now be conducted via the app, negating the need for hotel guests to call or go down to the front desk. 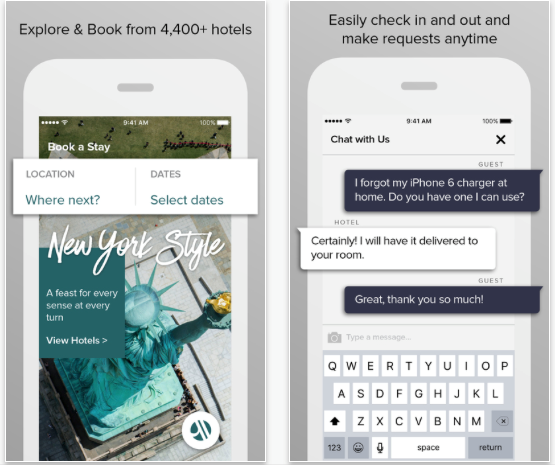 Users can also turn to the app to chat directly with hotel staff before, during, and after their stays should they require personal attention or have a special request, such as additional towels or pillows. 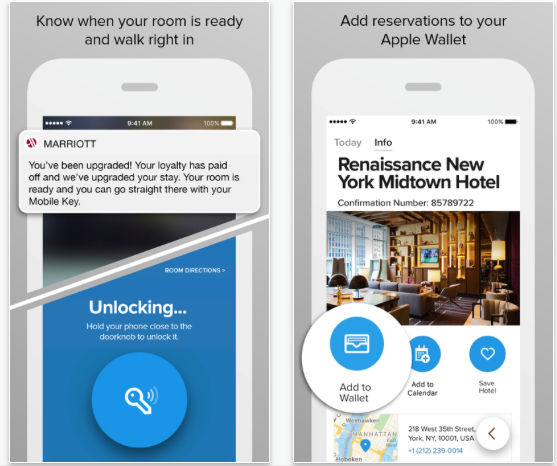 Another particularly nifty update is the expansion of the Mobile Key feature, rolling out to in excess of 500 hotels globally, whereby users of the Marriott app can completely skip their visit to the front desk after mobile check-in and head straight to their room, using their smartphone to unlock the door and enter. What these updates aim to achieve as a by-product of the additional convenience and functionality is greater usage of the app itself. Marriott claims that apps lose an average of 75% of daily active users within 90 days of being installed, and so, delivering new, hi-tech features is a great way to combat against such a high churn rate. David Menda, Director of Mobile Engagement at Marriott, explains that by offering customers a greater variety of relevant actions that can be taken within the app, the company is giving users more reasons to fire it up and gain a better experience with Marriott International. Speaking at Adobe’s 2017 summit in Las Vegas, Mendes said that success in driving in-app actions lies not in pestering users with endless push notifications that send users away from the app, but rather ensuring that the most relevant and valuable options are presented at the right times. Available globally in English, French, German, Spanish, and Chinese, the new Marriott app is set to deliver an unparalleled mobile experience for Marriott members around the globe. A personalized travel concierge service at the fingertips of Marriott’s 12 million members – who now have even greater access to the company’s rewards program via the app – reveals a strategy to retain the company’s share of the travel market on mobile, drive loyalty, and continue to improve upon the already-impressive 60% of traffic that comes to Marriott from mobile. Hear Carol Radigan, Sr. Manager, Digital Acquisitions and Innovation at Marriott at Mobile Shopping 2017 this October.